Luminar 2018 Review - Is Luminar Good Enough to Compete With Other Editors? This is a 100% honest, 100% authentic Luminar 2018 version 1.2.0 photo editing software review. Dadtography received a complimentary download of the product, but we were not compensated in any way for this post. Some links below, marked as (af), may be affiliate links. Sales made resulting from clicks on affiliate links provide a small percentage of each sale to Dadtography.com. All images are originals taken by Dadtographer Daniel and edited exclusively in Luminar 2018 (af). Most photos were edited using DNG source files. Please don't use our photos without permission. Updating this Luminar 2018 review post because Luminar 3 is coming out in just 10 days. Luminar 3 is a major upgrade to the photo editing software, adding the long-anticipated "libraries" (gallery / organization) feature. Be sure to check out our brand new Luminar 3 review to see the latest on this new version! Luminar 2018 is the next big step toward a market-dominating photo editor. It's faster, more powerful and more intuitive than anything else we've used. What's new in Luminar "Jupiter"? Skylum just released version 1.2.0, known as the "Jupiter" update and included a lot of features and fixes. See a few of our first images edited using Luminar 2018. Learn more about the latest version of Luminar. Learn more about Luminar 2018 for Windows users. Learn more about the new additions to the latest release. Read our thoughts on ease of using Luminar 2018. See the full list of features (there are 75) in Luminar 2018. Compare the Luminar 2017 and 2018 user interfaces. What does Luminar need to improve? No software is perfect. What needs to be improved with Luminar 2018? Check out this quick demo video of the filter presets in action. What's new with Luminar "Jupiter" - version 1.2.0? Skylum, the makers of Luminar 2018 (af) recently announced a major update to their flagship photo editing program. The update, known as "Jupiter" includes a lot of enhancements, with a focus on performance. The update gives a lot of "love" to the Windows version of Luminar as well. Below are some of the key highlights in this update. Luminar "Jupiter" and the focus on performance. Better RAW conversion including refined initial brightness settings, improved de-mosaic process for cleaner image conversions, fewer halos and more camera compatibility. Luminar "Jupiter" gives Windows users much-needed love. Preview mode. To check out a photo free from any distractions users can now use Full Screen Preview - a great way to really study an image in detail. Below is a gallery of the very first images we've edited using the new 2018 version of Luminar. Included is an unedited "before" version as well as the "after" Luminar edit. Use the slider on each image to compare the "before" and "after" versions. First, what is Luminar 2018? Luminar 2018 (af) is the latest update (essentially version 2.0) of the popular photo editing software that provides both Mac and Windows users with an intuitive yet powerful multi-purpose photo editor. Clearly, Macphun is setting Luminar up to be a major competitor in the photo editing space with this update. Luminar 2018 represents a genuine step toward a viable Lightroom alternative, but it's not without faults. We'll get into those a little further down. This Luminar Review focuses on the Mac version of Luminar 2018. We're a Mac-only household, so this review will focus on the initial release 1.0 of Luminar 2018. This review will focus on Luminar 2018 as an application and not necessarily drill down on the differences between Luminar Neptune 2017 and Luminar 2018. There are new enhancements included in this release of Luminar and those are mentioned below. What's new in 2018 (Neptune) vs Luminar Neptune 2017? The digital asset management (DAM) features will be a FREE upgrade to existing Luminar 2018 users and will be available in 2018. Luminar 2018 - What are the features of this photo editor? Luminar 2018 includes Windows support from the very start. 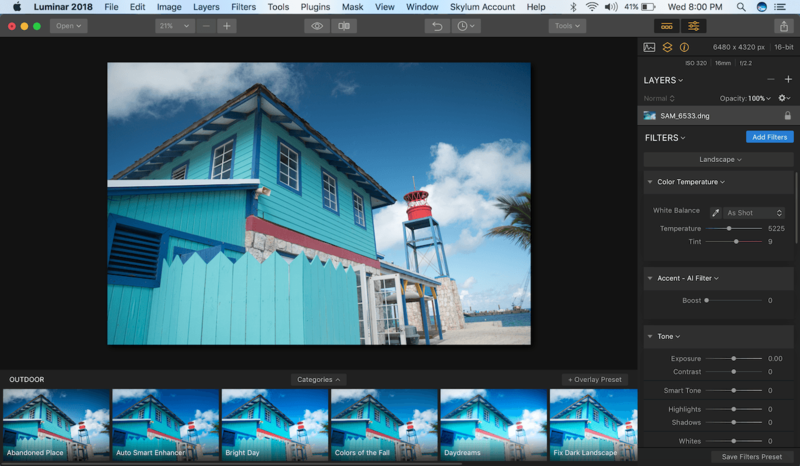 Awesome, intuitive and affordable image editors are no longer a Mac-only thing! Powerful photo editing is no longer exclusive to Mac computers. Luminar 2018 includes a Windows version. Be honest - is Luminar 2018 easy to use? In a word? YES! I started using the Luminar product during the 2017 "Neptune" release and have totally fallen in love with how easy and powerful this photo editor is. The controls are intelligently arranged in the interface, icons are intuitive (and when they're not, they have provide hints). Check out the side-by-side comparison of Luminar Neptune 2017 and Luminar 2018. You can see a few subtle differences between the two interfaces in these screen shots, but nothing too major. The designers and developers really are trying to make this the best photo editor available on the market, and it shows. If you're already running Luminar Neptune 2017 on a Mac, you better get this upgrade so you have access to the DAM (digital asset manager) coming out in 2018! Existing Luminar users, get this upgrade so you have access to the new digital asset manager (DAM) coming as a free update in 2018! Luminar isn't perfect. Here are a few areas Luminar 2018 still needs to improve. No software product is perfect. As someone that's worked on software and app development teams for years, I know this to be true. I'm sure the developers of Luminar also have a list of things they'd like to fix and add to their product. Overall, it's still the best photo editing tool I've used, but it can (and likely will) be improved. The interface changes to Luminar 2018 were unnecessary. The first thing I noticed that I didn't care for, but is also a personal preference, are some of the changes to the user interface. For example, the slider controls are smaller in the latest version. That has the added benefit of making them more vertically compact, but I also felt it took away from the aesthetic of the app just a bit. Luminar 2018 still lacks photo organization tools. One of the biggest advantages that one of Luminar's biggest competitors have over it is the ability to manage your photo library. As I mentioned in my Aurora HDR vs Adobe Lightroom comparison post, Aurora (like Luminar) also lacks a serious digital asset management (DAM) tool. Fortunately, in the case of Luminar 2018, a DAM is on the horizon, but for now, the product still doesn't offer much for those that have a lot of photos to organize. Luminar 2018 Windows and Mac don't have feature parity. Luminar 2018 will be available for both Mac and Windows machines, but they won't share the same features at the launch of the product. Like the DAM, features will be added to the Windows version over the course of the upcoming months, but if you're a Windows user, don't be disappointed to see a few key differences in the program for a while. Luminar 3 with Libraries is HERE! 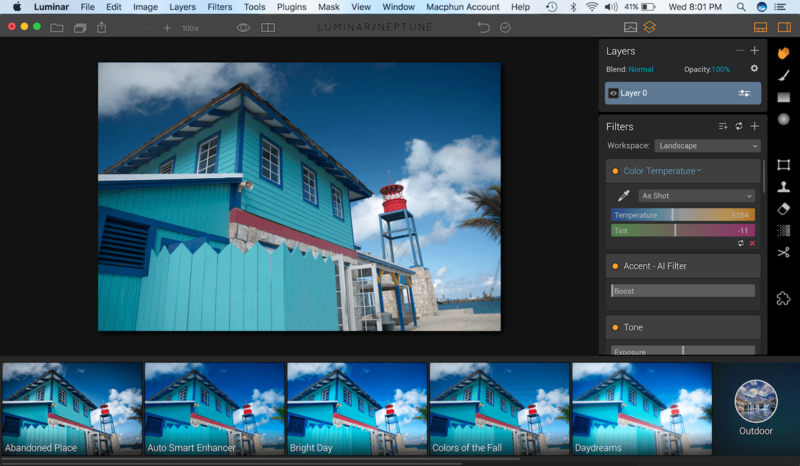 Luminar 3 with libraries was launched on December 18, 2018. Upgrade from Luminar 2018 at a special discounted price or purchase Luminar 3 now and you can instantly download Luminar 3 with libraries full version! Don't forget to use our special discount code DADTOGRAPHY and save $10 off your order!